Our cabins are situated in scenic locations where your team can enjoy the beauty of the Great Smoky Mountains. However, don’t let the term “luxury” fool you! Many folks immediately think this means expensive, but our cabins are actually a much better deal than a hotel room! Just calculate how much it would cost to book separate hotel rooms for all of your team members and you will find out how truly affordable it is to stay at Large Cabin Rentals. Take a look at our Cabin vs. Hotel Room Calculator to calculate your savings! When staying at our Pigeon Forge cabins for rent, your team members can take advantage of our convenient exercise facility for a pre-game workout! Our newly renovated facility includes a treadmill, free weights and weight machines where you can work up a sweat in preparation for your big match. The exercise room also contains a refreshing sauna and steam room where you can kick back to rest your muscles after an intense workout. Our large cabin rentals are conveniently situated in an ideal location just minutes from the venues and attractions of the Great Smoky Mountains! Whether you are participating in a volleyball tournament at the LeConte Center in Pigeon Forge or a basketball championship at Rocky Top Sports World in Gatlinburg, you will love the easy access to our cabins. Your team will also enjoy the gorgeous scenery that surrounds our cabins as they unwind in the evening. While your team members are between practice sessions and tournament games, they can kick back at Large Cabin Rentals to take advantage of our many fantastic amenities! The hot tub is an especially popular amenity as it gives everyone a chance to soothe their muscles after a tough game on the field. Our cabins also have game rooms where your players can practice their team spirit with billiards, foosball and all other types of great games! Many of our Pigeon Forge cabins for rent even have theatre rooms where you can enjoy a fun night at the movies right under your own roof. Both team members and chaperones will have a blast staying in our cabins! When it comes to getting sports teams or any other large groups together, it is just easier to have everyone dine together at the same time. 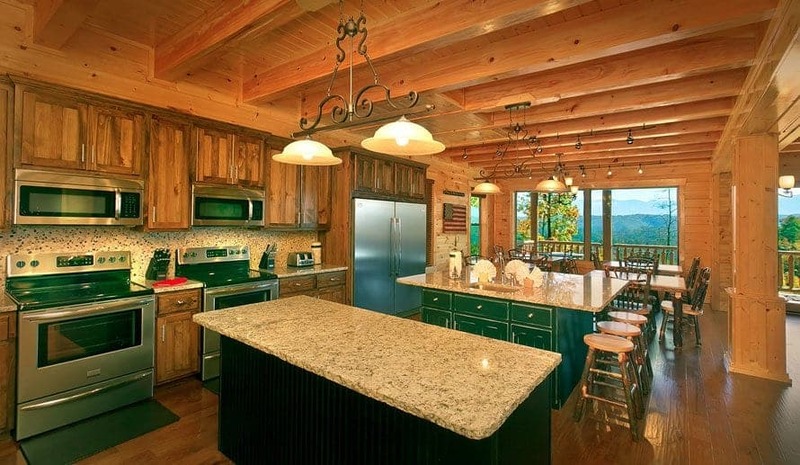 Our cabins feature full kitchens with modern amenities so that you can prepare a team breakfast or dinner with ease! Simply bring some supplies from home or pick up groceries at one of our many local supermarkets. This sure beats trying to get the team together for dining at a restaurant, not to mention the expense! Check out our Pigeon Forge cabins for rent today to start planning your stay in the Smoky Mountains! We look forward to hosting your team at Large Cabin Rentals!